The quilt top is finished. This quilt is for my little lady. Little girls riding scooters, swinging on swings and puppy dogs. Can it get any better? It's such sweet fabric that I decided to let it do all the work. Simple quilt design for simple pleasures. 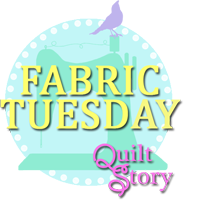 This has been my Fabric Tuesday which I'm linking up over at Quiltstory. What fabric have you been playing with today? No time for fabric play today, but your Sherbet Pips is great! I also want to let the fabric take centre stage! Any ideas how you are going to quilt it? Oh how I love Pips! My first ever quilt that I made back in February this year was from a Pips Jelly roll. It was meant for my eldest son, but it lives permenantly in our lounge room. Great quilt! I can't wait for the new line from the creator of Sherbit Pips, Little Apples! Fun, I sure do love those Pips, so cute! Give yourself a hug for a superb quilt, love the Pips!! Super sweet - the layout really does feature the prints nicely. Love your quilt. Yummy colors and you really used them well in this cheerful quilt. Great job. Sherbet Pips is a great range and your quilt is delightful. I love your quilt...perfect fabrics for it, and it looks great with the white!